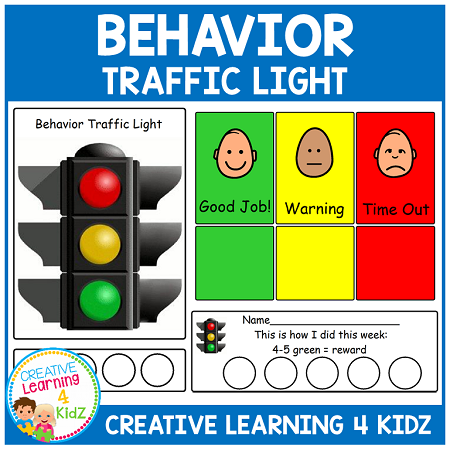 The Traffic Light method is a great way to establish very clear behavior expectations. It is a very simple and visual method to track each student's actions throughout the day. This method can be used with a Traffic Light or Colored Cards. I have included both so you can see what works best with your students. The Behavior Traffic Light can be placed on each students desk. They will start the day with their name circle on the green light. If you are using the cards you can punch a hole in the corners and add a book ring to hold them together. The cards can be placed on the students desk with the green card on top. Give the students a verbal reminder for inappropriate behaviors. If the behavior continues, they will move their name to the yellow light or their yellow card will be put on top. Let the child now you are watching to see if he/she will fix their behavior. If he/she does, then have them change the light or card back to green. If there is still no improvement, or an escalation of behavior, they will move their name to the red light or the red card will be put on top. The child will then need to go to time out and calm down. Students will mark the color they end each day on the How I did this week cards. These cards can be sent home to parents at the end of each week. 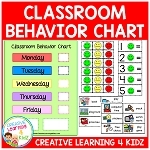 Student's with 4-5 green colors on their chart can earn a reward. Students with 3 or less green colors on their chart will not earn a reward but will be encouraged to put forth extra effort the following week. These Traffic Light cards are also great to use at home. 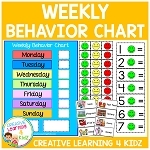 You can use them to teach your child what is appropriate and inappropriate behavior throughout an entire day. Eventually, you may get to the point where you can say "Show me green card behavior" without having to show the card.